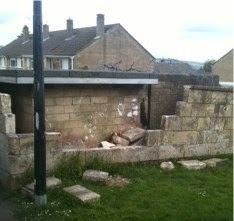 The dangerous wall at the back of the garages for Burford Close that facces onto Southdown Avenue has been reported to Environmental Services at the Council on Healtyh and safety grounds. Children often play by the wall and its poor repair is dangerous. We do not yet know who the legal owner of the wall is but as soon as that is determined we will endeavour to get it repaired swiftly.